In the circle of life, everyone dies. But what if a part of you could continue living, even after your body has expired? Thanks to modern medicine, you could extend life for others if you choose to donate your body’s organs, eyes and tissue after your death. What a remarkable, even heroic gift. Personally, organ donation is important in my life. My older sister Barbara has been living with a rare lung disease for two decades, and her doctors have told her she may only have a few years to live. Following a battery of tests, Barbara is now on the list for a double lung transplant. April happens to be National Donate Life Month. Its purpose is to honor those who have donated, celebrate those who have received transplants, and highlight those who are waiting for a donor match. I’ve been doing some research and was encouraged to read that nationally, about 90 percent of Americans say they support organ donation. Yet, only 51% of the U.S. adult population is registered as a potential donor. This significant gap means there are not enough donations for those who need them. On average, 22 people a day will die while waiting for a suitable match. One of these people could easily be my sister. According to the United Network for Organ Sharing (UNOS), over 121,000 people in the U.S. currently need a lifesaving organ transplant, and every 10 minutes another person is added to the list. In 2015, there were 30,969 transplants — a remarkable number considering that transplants have only been successful since the early 1980s. However, when you compare the number of people waiting and the number of transplants performed, the difference seems huge. It made me wonder why more people are not opting to check the organ donation box when they obtain or renew a license with their local DMV or by registering online at Donate Life’s Facebook page. While many potential donors remain squeamish about the topic of donation; there are also many unfounded fears. To separate fact from fiction about donation and organ procurement, I found two online stories, the first compiled by The Mayo Clinic and titled, Don’t Let the Myths Confuse You, and a page on the DMV website devoted to the misconceptions surrounding donation. Those concerned their faith would disapprove of their decision to donate, needn’t worry. All major religions allow and support organ donation. In fact, many clergy have described donation as a final act of compassion and generosity. 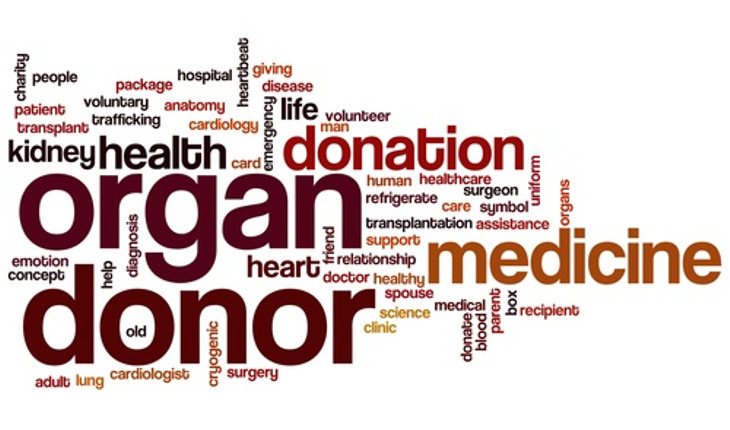 Donors can choose to give all of their organs, eyes, and tissue or the donor may designate specific organs and tissue for donation. Age isn’t a determining factor as donations are carefully evaluated after death to determine viability. Donations are needed and considered in every age group. Money isn’t a barrier, either, since there is no cost to the family or the deceased estate. Organ procurement and allocation are all tightly managed. Organs are not sold on a so-called black market. Likewise, everyone is considered equal when they are on the transplant list, which means no one, even those who are famous and/or wealthy, are never given priority. Some individuals are fearful that agreeing to posthumous organ donation could cause physicians to hasten a death to procure body parts. However, unlike what you see on television dramas, the medical team working to save your life is totally dedicated to that end. This team is separate from a team that could procure a donation. Additionally, there are stringent procedures in place to maintain that integrity. Until very recently, I thought the same thing. While I’ve always opted “yes” on every DMV form to allow for organ donation, I never considered transplantation could potentially save the life of someone I love. Now a lung donation might save the life of my sister. I’m grateful to those who have already decided to give the gift of life at the end of their life, and I encourage others to make the choice to donate. It’s a selfless decision. Don’t stand back; hoping it will never happen to you. Register today to be a donor, and a part of you may someday live on in someone else.